It’s the first anniversary of what the world knows as ‘the Qatar crisis.’ It seems there are no breakthroughs on the horizon and that we must get used to the Gulf situation amid the loud media frenzy between Qatar and the four boycotting countries that clearly voiced their concerns over the country’s policies that have caused confusion in Gulf and regional affairs. Meanwhile, Qatar feels the isolation from its immediate surroundings, the decline of its role and the undermining of its dreams. This crisis did not come out of the blue and was not a sudden shock to us, but was a natural outcome of Qatari policies which had overestimated the country’s size and role in the region and displayed an opportunistic orientation that neither concurs with loyalty nor is commensurate with the ideals of Qatari and Gulf interests. Qatar’s relations with Gulf and Arab countries have witnessed minor to medium-level crises from the beginning. Thus, it was natural for the situation to lead up to the 2013 and 2014 crises, which concluded with reaching an agreement that the new Emir did not respect, although he had asserted his commitment to it in the presence of Gulf leaders in Riyadh. There is no doubt that issues which gradually accumulated since the 1995 coup greatly contributed to the lack of trust in Doha and its commitments. This is an essential aspect for understanding the four countries’ approach towards Qatar’s foreign policy as Doha has since 1995 adopted a project that does not match its geopolitical stature. It has sought from the start to achieve its ambitions by using its financial capabilities in a series of opportunistic partnerships that included building ties with Hezbollah, the Syrian president, the former Libyan leader and the Muslim Brotherhood. It is through these partnerships that Doha sought to enhance its regional presence by hosting the US military base and through the Al Jazeera news channel project. Qatar gradually began to dabble with such contradictions. Its foreign policy initiatives focused on mediation, which is a traditional approach of small countries in international relations. Qatar then began seeking a bigger role – a role that was not backed by economic interests, military power or industrial heft. As the Qatari crisis continues, we see new dynamics for relations in the region because Doha’s role has been marginalized as a result of its poor choices. The project from the very beginning sought an individualistic approach for which networks were built and money was spent. It belied blatant opportunism that we’ve witnessed in the normalization of its relations with Israel, which was done to build bridges with the West in support of the project. It’s difficult for such high stakes political ambitions to be in sync with real interests of a conservative Gulf state, and these are costly ambitions of a ruler who loves politics and wants to immerse in it. Still, there were no objections as long as this project did not concern the stability of the region or adversely affect the security and safety of neighbors. This is an important point. The sovereignty and independent foreign policy is one of the Gulf Cooperation Council’s norms and there has never been an objection to the policies of this or that Gulf state. However, when it turned out that the individual project which Qatar had adopted was inimical to the security of the region and the stability of its countries, clarity and confrontation became essential. A year after measures for the boycott were taken, we can see that the essence of the dispute remains the same. Qatar still supports extremism and terrorism and has taken on plenty of terrorist projects in the Arab world. There is plenty of evidence to substantiate this, including Qatar’s role in Libya, its support of the Muslim Brotherhood and of other groups linked to al-Qaeda in Iraq, Syria and Libya. After its crisis, Qatar pledged several commitments to Washington, but initial indicators show its lack of commitment. Within this context, it’s no secret that the Qatari terror blacklist, which was published after American pressure, was partially from the four countries’ list against Qatar. There is plenty of other evidence. Qatar’s continuous interference to violate the security and stability of the four countries as well as other countries is plainly evident. The now-famous audio evidence showing Qatar’s former Emir and his foreign minister conspiring against Saudi Arabia and its King with Qaddafi is one of the most prominent proofs of its resounding decline at the political level. The hallways of the Gulf Cooperation Council have witnessed several discussions over Qatar’s systematic and documented interference to undermine Bahrain’s security. This is in addition to its role in destabilizing Egypt and the UAE. What’s strange about Doha’s response to this crisis and its dealings with the four major Gulf and Arab countries is its intransigence and complete lack of wisdom, all with the aim of protecting its project which has directed its course since 1995. In addition to its refusal to review ties with its neighbors, Doha has also leveled accusations, raised the slogan of sovereignty and screamed that it’s being unjustly treated. Its ministers have traveled across the world to promote a losing cause. It has raised the issue like a public relations’ battle that can be won by whoever makes the most noise. Many countries have benefitted from this Qatari dream and have sealed rewarding contracts knowing that the opportunity is good for making such a gain. Qatar has pursued conflict and intransigence and has relied on a vision of suspicion to manage international relations. Hopes of western intervention for settling this Gulf problem have evaporated and Qatari diplomacy has exposed how unmindful its moves have been towards resolving its real crisis. In order to end this crisis, Qatar must review itself and stop supporting extremism and terrorism and undermining the security of its neighbors in the region. This is easy to do and it requires the condition of honesty with one’s self and with others. One year has elapsed since the Qatar crisis. We realize that the main factors which led to this crisis are still extant. It’s not possible to resolve it without resolving Qatar’s support for terrorism and extremism and without backing down on harming others. The solution – as learnt by experience – requires guarantees because there is no trust in the Qatari leadership especially given the experience in 2013 and 2014 and amid the stubbornness and misguidance which has distinguished Qatar’s management of its crisis during the past year. As the Qatari crisis continues, we see new dynamics for relations in the region because Doha’s role has been marginalized as a result of its poor choices. Nothing will help it, neither destruction or bribes or over-hyped media coverage. The upcoming implementation of international and regional decisions will prevent it from attaining the partnerships it seeks. In the second year of its crisis, Qatar will try to revive international interest in its isolation. This will be very difficult because in the absence of wisdom, everything will be the same for Doha without anything changing and without altering the pressure it’s subjected to. As for the four countries, they have developed international relations which do not include its small neighbor, and they manage these relations without Qatar’s muddled presence. Qatar’s only role left is a media echo that is losing its credibility and gradually dimming. The four countries have plenty of options today in terms of dealing with the regional scene and arranging their alliance in support of security and stability in the region and confronting extremism and terrorism without this crisis affecting the strength of their presence on the regional, Arab and international levels. Dr. Anwar Mohammed Gargash was appointed in 2006 as Minister of State for Federal National Council Affairs. In February 2008, Dr. Gargash was given the additional responsibility of Minister of State for Foreign Affairs. In February 2016, he has been appointed as Minister of State for Foreign Affairs. He holds a number of positions in addition to his Ministerial positions as he is the Chairman of the National Elections Committee, overseeing the UAE’s first elections which took place in 2006 and the subsequent elections in 2011 and 2015. 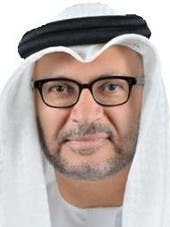 He is also the Chairman of the National Committee to Combat Human Trafficking, the Chairman of the Board of Trustees of the Al Owais Cultural Foundation, Member of the Board of Trustees of the Emirates Diplomatic Academy and Leads the UAE team for the Human Rights Periodic Review.